The predecessor to Helen Macdonald’s H is for Hawk, T. H. White’s nature writing classic, The Goshawk, asks the age-old question: what is it that binds human beings to other animals? White, the author of The Once and Future King and Mistress Masham’s Repose, was a young writer who found himself rifling through old handbooks of falconry. A particular sentence—“the bird reverted to a feral state”—seized his imagination, and, White later wrote, “A longing came to my mind that I should be able to do this myself. The word ‘feral’ has a kind of magical potency which allied itself to two other words, ‘ferocious’ and ‘free.’” Immediately, White wrote to Germany to acquire a young goshawk. Gos, as White named the bird, was ferocious and Gos was free, and White had no idea how to break him in beyond the ancient (and, though he did not know it, long superseded) practice of depriving him of sleep, which meant that he, White, also went without rest. Slowly man and bird entered a state of delirium and intoxication, of attraction and repulsion that looks very much like love. White kept a daybook describing his volatile relationship with Gos—at once a tale of obsession, a comedy of errors, and a hymn to the hawk. It was this that became The Goshawk, one of modern literature’s most memorable and surprising encounters with the wilderness—as it exists both within us and without. T. H. White (1906—1964) was born in Bombay, India, and educated at Queen’s College, Cambridge. His childhood was unhappy—“my parents loathed each other,” he later wrote—and he grew up to become a solitary person with a deep fund of strange lore and a tremendous enthusiasm for ﬁshing, hunting, and ﬂying (which he took up to overcome his fear of heights). White taught for some years at the Stowe School until the success in 1936 of England Have My Bones, a book about outdoor adventure, allowed him to quit teaching and become a full-time writer. 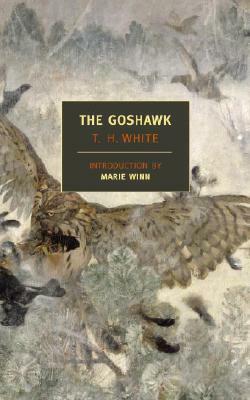 Along with The Goshawk, White was the author of twenty-six published works, including his famed sequence of Arthurian novels, The Once and Future King; the fantasy Mistress Masham’s Repose (published in The New York Review of Books Children’s Collection); a collection of essays on the eighteenth century, The Age of Scandal; and a translation of a medieval Latin bestiary, A Book of Beasts. He died at sea on his way home from an American lecture tour and is buried in Piraeus, Greece. Marie Winn’s recent book, Red-Tails in Love: Pale Male’s Story, featured a now-famous red-tailed hawk. Her column on nature and bird-watching appeared for twelve years in The Wall Street Journal, and she has written on diverse subjects for The New York Times Magazine and Smithsonian. Her forthcoming book, Central Park in the Dark, will be published in the spring of 2008.